My wife and I have been roasting lambs traditionally beside a log fire since our wedding in 1998. Since then we have been providing spit roast outside catering hire in Sussex. I have learnt this skill from my father-in-law, who was taught by his father many years ago. In those times, the spit was still being turned by a person continuously pulling on a chain. My father-in-law helped cook his very first spit roast lamb on his father’s knee at the age of about 10 months for “Horn Fair” at Ebernoe, a local cricket match and fair which goes back in history many years. I am proud to now be carrying on this family tradition! 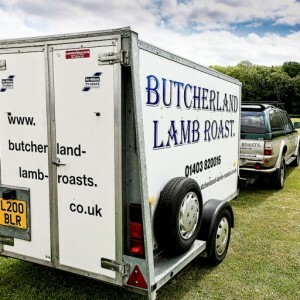 If you are considering booking us for an event hire and would like to meet us first to see a traditional lamb roast, a day at “Horn Fair” on July 25th is a great family day out, with the cricket match, stalls, cream teas, ploughman’s lunches, children’s races, fun fair etc. We strive to give 100% customer satisfaction every time while being entirely reliable, professional, but always friendly and approachable! 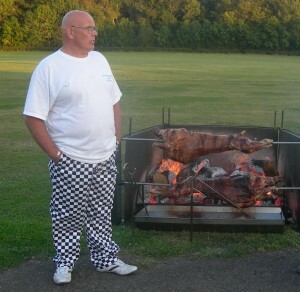 We provide spit roast outside catering hire in Sussex and the surrounding area. We cover a large part of the south of England including Gloucester, Oxfordshire, Buckinghamshire, Hertfordshire, Essex, Somerset, Wiltshire, Berkshire, Greater London, Kent, Dorset, Hampshire, Surrey & Sussex, and will always consider other areas. In the past we have travelled to Barnstaple, and Coventry to cater for a lamb spit roast event. Our supplier for our lamb roasts is “Fulk Brothers” a traditional family butcher in Pirbright near Guildford. They have two shops, one on the green in Pirbright and the other in Brookwood. Established since 1927, they are high quality butchers and are well known for their homemade sausages, organic lamb & local produce ! We choose our wood and wood suppliers very carefully. We only ever use Oak or Hornbeam that have been brought down by storms or has had to be removed. We prefer to use other sustainable wood such as Ash, Beech, Birch, Hazel or Sweet Chestnut. These are all trees that can be harvested and then harvested again in 10 to 15 years. This is very important to us and the countryside we live in !